I've always had a thing for stripes. But, lately, the stripes are in full effect. A lot of my graphic t-shirts don't really look amazing on a stretched belly so I've gravitated towards a trusty stand-by. Even with a simple outfit, stripes can elevate the "chic vibe." Eventually, I'll cave in and get more maternity tops but I'm going to get the most wear out of what I own now. I love the pops of pink and yellow, they really add such a cool element to your outfit. You are always so chic! I wished that when I was pregnant had used maxi skirts/dresses. They seem like such great maternity wear. I do remember how much I love maternity jeans, they are so awesome! This is such a cute outfit! I love that beanie!!! You look gorgeous! 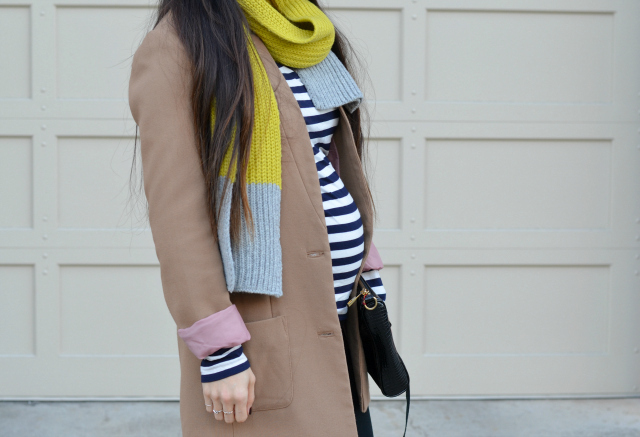 Loving the pop of yellow and the stripes look so cute on your belly! Super cute! I love the colorblocking and stripes combo! Loving the mixed stripes on you, most especially the color combo; the basic navy white, with the uber cool yellow-gray! Yes, it elevated, AND it highlights babybump, so a super pick! You are looking radiant and beautiful! Yup, stripes are always a classic print! Haha, and way to stretch out your use of your current wardrobe (literally, huh? lol). Your baby bump is so cute! Such a cute look! 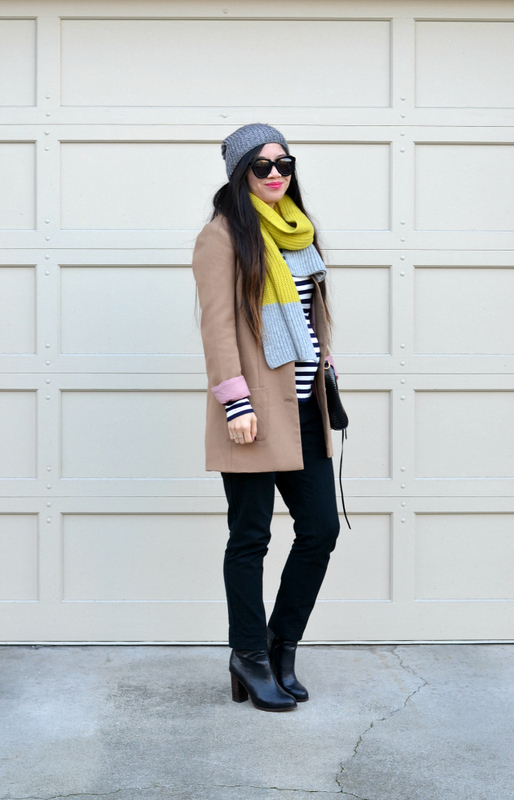 I love the pop of bright yellow you threw in with the scarf! You are adorable! Love this outfit!